Hierarchical micro-structures are composed of a primary micro-structure and secondary micro V-grooves (SMVGs) cut by the UPRM one-step method. The key problem is the existence of burrs and plastic deformation of the top of SMVGs during the fly cutting process. This paper presents a study of the burr and deformation information introduced by one-step cutting operation in ultra-precision raster milling (UPRM). A series of experiments was carried out to investigate the effect of cutting conditions on the quality of hierarchical micro-structures by the one-step cutting method. A single point diamond tool with a 40° tool angle was employed to perform the one-step cutting operation in UPRM. Hierarchical micro-structures were produced on copper material successfully. Large burrs and plastic deformation were formed when cutting with a fixed tool angle. These large burrs and deformation were found to be induced by cutting force and cutting parameters. It was found that large burrs are formed with an increase of the cutting depth, feed rate, and spindle speed; the plastic deformations become serious with an increase of the cutting depth and feed rate, but are reduced with a decrease of spindle speed. 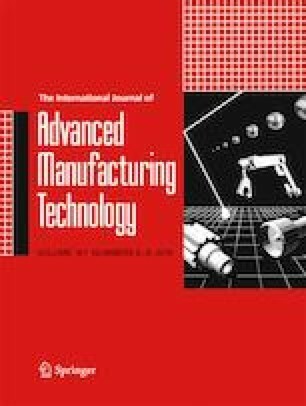 An experimental study was established to investigate cutting force as a function of the cutting conditions in relation to micro-burr formation in machining, and explore the problems associated with one-step fly cutting in UPRM. The mechanisms of burrs and plastic deformation of SMVGs are discussed to further improve the machining process. The work described in this paper is partially supported by the Shenzhen Science and Technology Program (JCYJ20170818135756874) and the Shenzhen Polytechnic research Funds (no. 601822K21017).